Everyone loves a good burger. Whether beef, turkey, salmon or veggie, everyone loves some version of a burger. That includes canines, who are often found gazing longingly at their owners' burger-filled hands. The good news is pet parents don't have to deny their pups' cravings -- you can make burgers for them, too. 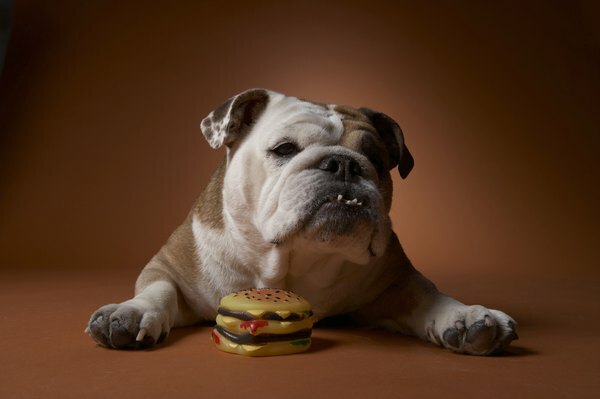 Meat should form the base of any dog diet, and a nice juicy burger fits well into that plan. Generally, meats should make up anywhere from 50 to 75 percent of your pup's meals. Meats have a range of calorie content, so you can adjust serving size depending on your dog's dietary needs. Per ounce, ground beef has about 55 calories, with bison around 65. Salmon contains around 50 per ounce, and ground turkey about 45. Burgers are generally associated with beef. Although beef is OK for some dogs, many can't process it. If your dog tolerates beef, you can make hamburgers for him by shaping the meat into patties, and grilling or sauteing until desired doneness. Choose lean cuts -- too much fat can cause indigestion, acid reflux and other problems. If your dog has never tried beef, offer a tiny amount at first, and skip the onions, as they're toxic to dogs. Many meats translate to many yummy burgers. Ground turkey, bison and buffalo, along with seafood like salmon, tuna and other fish make great beef substitutes. Ground meats generally require the same cooking methods as beef -- just shape patties and cook through. For fish burgers, you can use egg and bread crumbs to bind the burger. Mix fish with one egg per burger, then add crumbs until you're able to shape patties. Cook about 15 minutes or until done. Always introduce new foods slowly. This allows you to monitor your buddy, in case he has a reaction or sensitivity to a particular food. If your freshly made burgers are a new menu item, offer one bite or two at first. Save the rest, and if he does OK, offer two or three bites the next day. Assuming all goes well, you and your pup will fully enjoy this American classic together in no time. What Purpose Do the Whiskers of Dogs & Cats Serve? Do Dogs Need Their Tails for Balance? How Should I Set Up My Aquarium for My Livebearers? How Do Cats Know to Make Eye Contact?